We at Anjou are committed to making you look – and feel – like a princess every day of your life. From 100% natural skincare products to hair curlers and straighteners to heavenly soft makeup brushes, Anjou is here to achieve professional beauty care results in the comfort of your home. 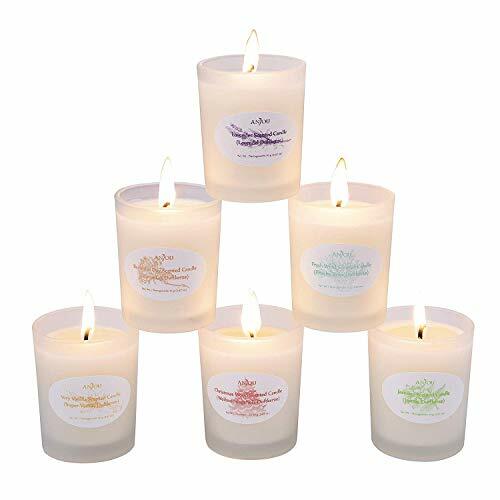 Provide a mood intensifying light to your home with the Anjou 6-Piece Aromatherapy Four Candle Set. Each candle is made from biodegradable soy wax and a cotton wick. Once lit, the candle will gently flicker away without producing harmful black smoke. The result is a warm atmosphere to suit your space. For some, a candle is best reserved for romantic moments. For others, it is to unwind and relax after a busy day. No matter your reason for enjoying aromatherapy candles, you can enjoy them in the bedroom, bathroom, around thehouse, or at special events like weddings and parties. Stuck on gift ideas for your special one? Need something for the folks? Packaged in an immaculately designed box, this Six candle set is the ideal present for birthdays, Christmas, anniversaries, Mother’s & Father’s Days, or other holidays. Strike a match and light the candle to enjoy up to 15 hours of inviting aromas and a soft, welcoming glow. Each candle measures a generous 2.1 x 2.6 inches for use wherever you like.